I just got back from picking blueberries. I happened to see the farm sign in Sale Creek and stopped during my lunch hour. Less than an hour later, I had picked more than eight pounds for about $10. That’s not counting the handfuls I ate while picking. Pollination was excellent, and fruit set was incredible this year. We also had adequate rainfall until July. Pick-your-own berry farms in the area are not the only sources for fresh blueberries. Farmers markets will have them for the next six weeks. Homeowners, too, can be successful in growing their own. More and more studies are reporting the health benefits of blueberries. They help with memory function, vision, urinary tract health, clearing arteries and strengthening blood vessels. Blueberries are the richest source of antioxidants. These compounds reduce cell damage, which is implicated in causing aging and cancer, according to the American Institute for Cancer Research. The guidelines for active women are to eat about two cups of fruit and at least three cups of vegetables each day. Blueberries are easy to grow with good soil preparation and care. Now is a good time to take a soil test and prepare the soil. Blueberries thrive in acid soil. Sulfur can be applied to make soil more acidic. Apply sulfur in accordance with instructions from the soil testing laboratory. Apply it several weeks before the intended planting date to allow equilibration. Repeat the soil test until the proper acidity has been attained. It is difficult to do this after planting. Mix an abundance of compost into the soil to increase the organic content of the soil. This improves the texture and drainage of the soil. 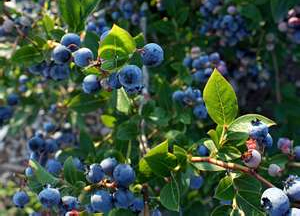 Blueberries should be planted while dormant, usually from November through March. Plant at least two different cultivars to ensure maximum pollination from bees. This cross-pollination among the different cultivars will result in better production and larger berries. Rabbiteyes (Vaccinium ashei) are generally the best type of blueberries for home gardeners in Georgia and Tennessee. Native to the Southeastern United States, they are the tallest of the blueberry bushes, growing up to 10 feet high. Tifblue has been the most popular variety for years. The blueberry season can be extended to six weeks by growing several cultivars. Austin, Climax and Premier are the earliest ripening rabbiteye varieties. Baldwin, Centurion and Delite are the latest maturing rabbiteye varieties. Blueberries grow best in full sun. They have shallow roots, so plant them away from tree roots that compete for water and nutrients. Mulch materials such as sawdust, bark, wood chips, straw or leaves spread six inches thick around bushes will conserve soil moisture and provide weed control. Fertilize according to the soil test after the plants have had their first flush of growth. Blueberry bushes will produce some fruit the second or third year after transplanting. By the sixth year they will yield as much as two gallons each. The yield will continue to increase for several years as the plants get larger. Blueberry plants can add beauty to the landscape. I have seen them planted among boxwoods and hollies in the front yard. Blueberries have great appeal because they have few pests or diseases. It is one fruit that home gardeners can grow successfully, even without sprays. Freezing is easy, too. They maintain their shape and taste great in the middle of winter, when fresh berries are expensive at the store. Once established, plants will produce for 20 years before a new planting is needed. Contact Tom Stebbins at tstebbins@utk.edu.